As my painting technique evolves, I find myself spending more and more time on each piece I do. I have been very fixed on surface texture and getting it just right. I am very pleased with this new painting. 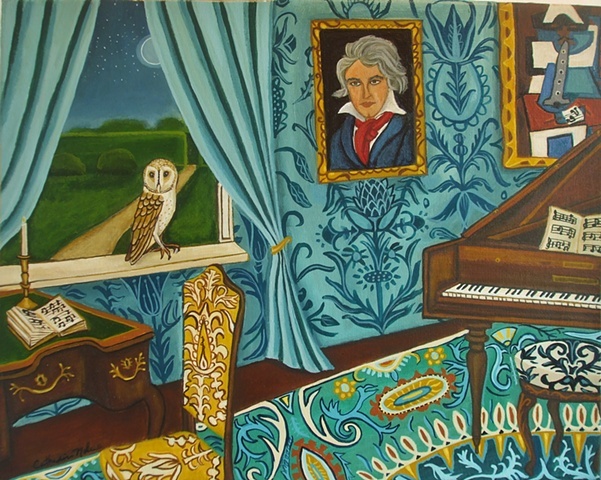 I found a photograph which showed what Beethoven's room might have looked like. The piano is actually accurate but of course his room didn't have quite as much going on as this one. It have combined all the elements I love. Music, interiors, birds, interesting colors and patterns that have movement. This painting is 11x14. The sides have been painted so no frame is needed but should have one! This painting would make a great gift for the music lover.